Retaining customers is far less expensive than acquiring new customers. Not only do loyal customers ensure sales, but they are also more likely to purchase additional products or services. Loyal customers reduce costs associated with consumer education and marketing, especially when they become Net Promoters for your organization. 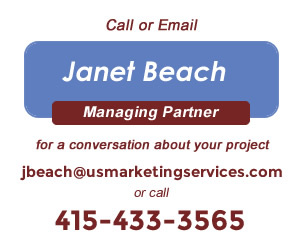 US Marketing Services provides greater clarity as to how and why companies chose products in your category and a better idea of what constitutes an ideal solution as defined by your target customers. Customer loyalty is built via a blend of the physical, emotional and value elements of the customer experience with your product /service resulting in one cohesive customer conclusion. Feedback from the team was very positive…Our work with you to focus on customer engagement has proven to be a valuable and enlightening project! It was also very valuable to connect and review our customer interview and validation process. US Marketing Services can help you increase levels of customer loyalty by identifying what the customer seeks and uncovering current barriers and helping to effectively address these.